We ran an exciting competition during June and July this year. 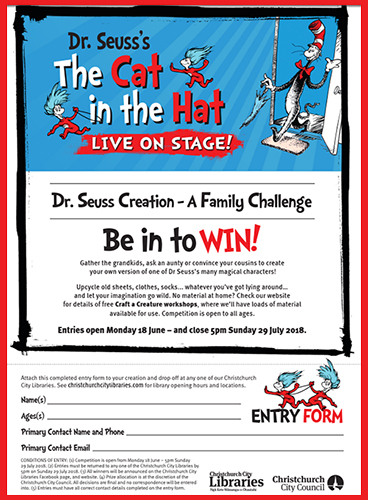 You could express your creativity and be in to win a family pass to The Cat in the Hat at the beautiful Isaac Theatre Royal on Tuesday 9 October! View all the winning entries and finalists. Upcycle old sheets, clothes, socks... whatever you’ve got lying around … and let your imagination go wild. No material at home? Come to a free Craft a Creature workshop, where we’ll have loads of material available for use (the workshops are on from 10 July to 19 July).